“There is no delusional idea held by the mentally ill which cannot be exceeded in its absurdity by the conviction of fanatics either individually or en masse.”–Lazare Hoche. Have I been angry about guns for too long? Is it time to put aside those feelings and work together with responsible gun owners for sensible gun reform? Isn’t it just too much to call firearms owners inherently irresponsible? To refuse to visit the homes of loved ones who refuse to lock up their weapons? What about David French’s recent story in The Atlantic, in which the senior writer for National Review argues that carrying a gun ties him closer to his community? French begins with a scary story: man approaches his wife while she is in the yard playing with the kids on their trampoline. He wears an empty holster. He demands to see her husband, who is not at home. The police are far away and the woman forgot her gun inside. What is she supposed to do? Well, she defused whatever “situation” that French doesn’t explain happens by talking to him. So, talking worked. But it might not have, French implies. She might have needed to kill someone. In just the last five years, we’ve faced multiple threats—so much so that neighbors have expressed concern for our safety, and theirs. They didn’t want an angry person to show up at their house by mistake. We’ve learned the same lesson that so many others have learned. There are evil men in this world, and sometimes they wish you harm. French is right. There are bad people in the world. They do bad things. But Clutter-style murders, in which a random bad guys murder you in your sleep, are very rare. Murders generally happen in networks. You are far more likely to be murdered if someone you know has been murdered. French’s wife’s violent ex-boyfriend is a danger, as men who commit domestic violence are at increased risk of becoming murderers. French gives us a description of his wife being choked by her former boyfriend, suggesting that carrying a gun would protect women from such violence. The evidence suggests otherwise. The presence of a gun in a relationship where there is domestic violence simply increases the risk of death for the victim. Women who buy guns to protect themselves from violent partners are shot by those guns. French’s argument is meant to invoke our empathy. Here is a good guy, a reasonable person, who just wants to protect his family. He buys a gun and trains to use it; he takes this seriously. He also discovers a community–a word that liberals love, right?–of others who come together around this issue. At the end, you might be convinced that French’s effort to normalize carrying a gun while on a trampoline is as much as an act of caring for his community as is helping to build a handicap accessible playground. It’s not. Look at his argument again. His wife was playing with their kids on the trampoline, which, like other kinds of “attractive nuisances” (such swimming pools), requires extra insurance (which may be denied to the homeowner) and should be made inaccessible to children. Should she have had her gun on her while on the trampoline or taken it off and put it down (where?) while she played? Whose lives would have been endangered if she kept it on? Whose lives would have been endangered if she placed it on a nearby picnic table? A stranger comes to the house, and he is carrying an empty holster. Why does this scare French? He lives in Tennessee, he tells us, where both conceal and carry and open carry are legal. Does he think that a person with an empty holster is a danger? His fear illustrates the point of all of us who oppose handguns feel: We can’t tell if someone is dangerous if they are open-carrying. I don’t know if the man behind me at the convenience store is going to rob the place or just always brings his gun with him when he buys Twizzlers and a gallon of milk. I long for the days where someone walking around with a gun was announcing himself as a danger. Now I just have to be scared of everyone. French’s thinking has made the world more dangerous, and then he asks us to trust him that the solution is adding the very thing that makes the world more dangerous: guns wielded by overconfident people. Recently Joel shared a post in which he noted that it is different orientations toward communities that shape our attitudes about guns. Those who prefer hierarchies and individualism like ’em. Those who prefer community and responsibility to others don’t. (This is why French’s piece in The Atlantic might make your progressive heart melt for a moment. He got a community of gun-loving friends out of it!) I think that’s a smart assessment, and it’s also why fighting against guns requires change that is both cultural and societal. The facts are this: If you own a gun, you are more likely to die by a gun as well as by other forms of violence. You are more likely to cause the accidental death of someone else. You are more likely to commit suicide or have a suicide in the home. You are not safer. But what about the individual? Couldn’t David French be the exception, like that guy you once heard about who died BECAUSE he was wearing his seatbelt? Couldn’t the fact that a bunch of people in the alt-right really hate French and have it out for him mean he’s safer with a gun than without? Sure, right. The rules of actuary science aren’t like the laws of physics. There are exceptions. But even if French’s life is being protected, not risked, by his gun ownership (and his bragging about his gun ownership), he is imposing a risk on the rest of us. If David French and I are in a room together, if he is carrying a gun, I’m in more danger than if he were not. I argue that it’s not within his rights to increase this danger to me without my permission (which is why I oppose conceal and carry–because I am unable to discern the level of danger others pose to me when I can’t know if they are carrying guns). And gun fetishists all believe they are exceptional. Sure, police officers (who train a lot more than your average or even above-average handgun owner) miss their target almost 90% of the time, but we are told to believe that Mrs. French would have hit hers. Sure, AR15s overpenetrate,* making killing your target easy but not killing the man innocently watering his yard behind your target hard, but somehow, your teenager, whose brain can’t accurately predict the stopping distance of a car on a slick road, is going to handle that weapon just fine. Sure, even the majority of kids who have been trained not to touch guns do just that, but your child, waiting his turn for the trampoline, won’t pick up that handgun your wife put by the grill. Gun fetishists believe that they are somehow stronger, faster, smarter than guns–and their targets. But they aren’t. The evidence is in. 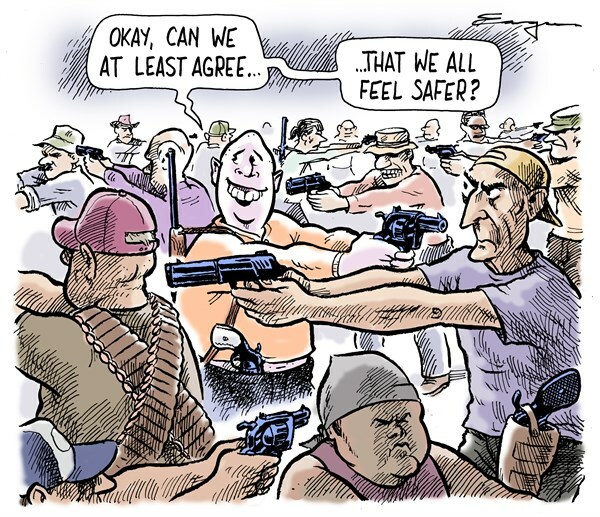 Believing that you are safer with a gun is a delusion. Widespread belief that more guns make a safer society is the kind of “mental illness” (as Hoche says) that will kill us all. But worse than the delusion of gun fetishists’ belief that guns make them safer is their belief, which is the heart of French’s essay, that their feelings of safety matter more than the actual bodies of other people. What an entitled position that is. And what cowards we all are, for letting children face lethal violence at school so that gun owners can feel better. *Yes, I know they overpenetrate less than some pistols, but your neighbor does not really care whether your teen accidentally shoots him with pistol or a AR15. He would prefer not to die. And, no, hollowpoint bullets are not a real answer to this problem, as you will find yourself realizing as soon as your toddler puts one in his sister.